Knowing how to handle a firearm is extremely important. This includes general etiquette when at a shooting range, carrying a gun safely and securely and storing it in a gun vault when not in use. When actually using a firearm, always point the muzzle in a safe direction (usually downrange), always use the gun’s safety when not shooting, be sure of the gun’s intended target and what lies beyond it, always use correct ammunition, use eye and ear protection and learn the mechanical and handling characteristics of the firearm being used. When not using a firearm, the safest option is to store it in a gun vault. Owning firearms comes with a significant responsibility. Guns are not inherently dangerous; but they can be when used and stored incorrectly. Keeping one’s firearms stored in a gun vault is the best way to prevent accidents from happening. Some people even keep their firearms and the ammunition stored separately to further ensure that accidents don’t occur. While taking advantage of your rights guaranteed by the Second Amendment, be sure to take the correct precautions. 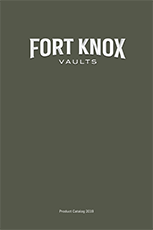 At Fort Knox, knowing that our products help responsible gun owners stay safe is one of our main sources of pride and satisfaction in our work.